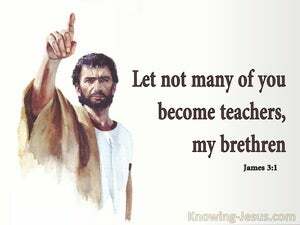 ﻿ James 3:1 Let not many of you become teachers, my brethren, knowing that as such we will incur a stricter judgment. Not many of you should become teachers, my brothers, because you know that we who teach will be judged more severely than others. Not many should become teachers, my brothers, knowing that we will receive greater judgment. Not many [of you] should become teachers ( self-constituted censors and reprovers of others), my brethren, for you know that we [teachers] will be judged by a higher standard and with greater severity [than other people; thus we assume the greater accountability and the more condemnation]. Not many of you should be teachers, my brothers, because you [should] know that we [teachers] will be judged more strictly. Let not many of you become teachers, my brethren, for you know that we who teach will be judged with greater strictness. My brethren, don't affect many of you to be doctors, considering, that those of us who are such, shall be tried with the greater severity. Be not many teachers, my brethren, knowing that we shall receive greater judgment. Be ye not many teachers, my brethren, knowing that we shall receive the greater judgment. My brethren, be not many teachers, knowing that we shall receive greater condemnation. My brethren, make not unto yourselves many teachers, knowing that we shall receive the greater condemnation. My brethren, be not many teachers, knowing that we shall receive the severer judgment. Not many should become teachers, my brothers, [because you] know that we will receive a greater judgment. My brothers, do not be many teachers, knowing that we shall receive the greater condemnation. My brethren, be not every man a master; Remembering how that we shall receive the more damnation. My brothers, do not swell the ranks of the teachers; remember, we teachers will be judged with special strictness. Do not become many teachers, my brothers, because you know well that we teachers shall be judged by a severer standard than others. BE not many of you teachers, my brothers, knowing that we shall receive a severer judgment. MY brethren, be not many teachers, knowing that we shall receive a severer judgment. I do not want many of you, my Brothers, to become teachers, knowing, as you do, that we who teach shall be judged by a more severe standard than others. Do not be eager, my brethren, for many among you to become teachers; for you know that we teachers shall undergo severer judgement. Many of you, my brothers, should avoid becoming teachers, because you know that we teachers are going to be judged with stricter judgment than other people. My brethren, become not many of you teachers, knowing that we shall receive the greater judgment. 1 Let not many of you become teachers, my brethren, knowing that as such we will incur a stricter judgment. 2 For we all stumble in many ways If anyone does not stumble in what he says, he is a perfect man, able to bridle the whole body as well. wanting to be teachers of the Law, even though they do not understand either what they are saying or the matters about which they make confident assertions. "As for the man who does this, may the LORD cut off from the tents of Jacob everyone who awakes and answers, or who presents an offering to the LORD of hosts.